While much of the work of Eskolta can seem to focus on the transfer school world, many of our projects can involve district offices, middle schools, and more traditional high schools. 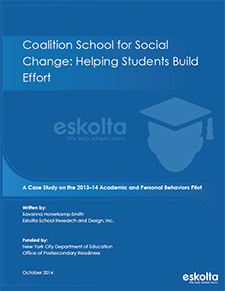 Our case study on our work in one high school in Manhattan, Coalition School for Social Change, offers some insight into Eskolta’s involvement in citywide initiatives, academic behaviors coaching, and our documentation style. Coalition School for Social Change: Helping Students Build Effort is one of five case studies written on the Academic and Personal Behaviors Pilot, an initiative of the NYC Department of Education’s Office of Postsecondary Readiness. In the 2013–14 school year, four New York City middle schools and five New York City high schools took part in the project and were asked to modify the way in which they gave feedback to students toward the development of growth mindsets and promotion of academic persistence. This study spotlights the changes that three educators – teachers Sara Powers and Randi Albert and principal John Sullivan—of Coalition School for Social Change made in their classrooms and the impacts those changes had on their students. Insights from the three educators’ stories reveal how coupling feedback with expressions of high expectations and faith in students’ capabilities can influence student motivation, particularly in the level of support felt by students when tackling challenging academic work. The study also provides a valuable lesson from the experiences of the three teachers on how students began to take more ownership in their work when they regularly engaged self-assessments.